There once was a moderately committed vegan who had two children. He did his best to feed them well, with a healthy mix of plant-based foods (and the occasional dessert). He also tried hard to take them outside for some exercise every day. But in an east coast town, weather is inevitable, and when the rains came down, this man had limited options to keep his kids entertained. The mall playground. Chick-fil-A. McDonald's. (Or "Inside park," "Chickalay" and "Old McDonald's" as his kids called them.) These were the options, and out of the three, Old McDonald's had the best play place. It could be dirty at times, and with this season's high level of flu going around, he carefully weighed his options each time the sun didn't shine. But occasionally Old McDonald's won out, and there they headed, sanitizer in tow. But what does a vegan eat at McDonald's, or any fast food restaurant for that matter? Not much. A bunch of fries and a glass of sweet tea or coffee were his go-to choices. But on this day, a cloudy, drizzly Monday, he decided to expand his horizons and order a single Happy Meal for them all to share. 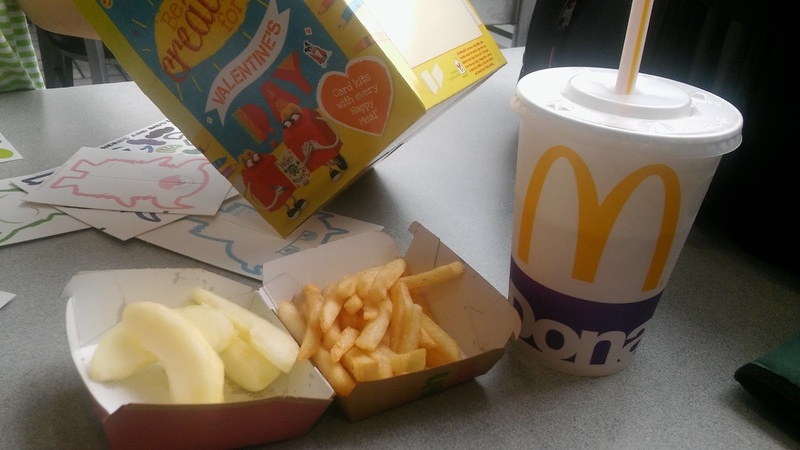 The fries were pretty skimpy, as well as the apple slices. The drink was nice, as three or four cups of tea can make up for a lost dollar or two. The toy was also a good one -- cutout monsters with stickers for Valentine's Day (nothing says, "I love you" like a pink smiling monster with horns and three eyes). All in all, it wasn't a terrible choice, though he thought a side order of oatmeal and a sweet tea may have been worth the extra thirty cents.